Become CompTIA Linux+ - Certified Stress-Free! Includes 121 Questions & Answers. Includes 178 Questions & Answers. Interactive Testing Engine is our proprietary interactive software that fully simulates interactive exam environment. We fill the Testing Engine with real questions and verified answers for your desired exam. Once you download and install the Testing Engine to your computer, you can start practicing in the interactive environment. The software allows for multiple modes and features. For example, you can use Training Mode, where you don't have a time limit, or set the time limit for your exam by switching to the Virtual Exam option. Furthermore, you have options to show or hide answers and do other adjustments to the software to enhance your interactive learning experience. This format of interactive exams is a popular and proven way to learn, so you can memorize things better, and benefit from real exam questions. I have just made a purchase. Where can I download my product? Thanks for choosing Train4sure! Now login to your Member's Area, and you can download your products from there. How long will I be able to use the product for? Your product will remain valid for 90 days after your purchase. After that time, you will need to renew your product if you want to keep using it. My product has expired. How can I renew it? Once the validity of your product is over (90 days after the purchase), you can renew it with a 30% discount in your Member's Area. How often do you update the materials? Overall, we update our materials on a daily basis, or whenever an update is released. We keep track of all exams and questions, so as soon as the update to your exam is released, your Testing Engine also gets updated. Yes, the updates are free. Whenever an update is released, your Testing Engine will automatically sync with our server to download the update. You won't have to pay anything for the updates. How many computers I can download my Train4sure purchases to? You can download your purchases on the maximum of 2 (two) computers. Should you need to use more than 2 (two) machines, you can increase this limit when you make the purchase at the checkout. Do not hesitate to contact us if you need to use the Testing Engine on more than 5 (five) computers. What are the system requirements to run the Testing Engine? At least 30 MB available hard disk typical (may vary depending on the size of your exam). 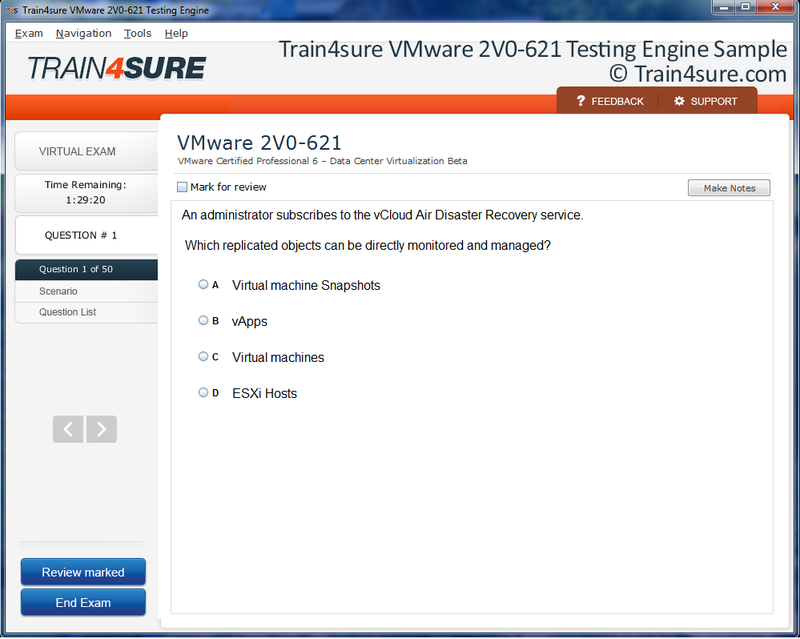 PDF version is .pdf file of your Train4sure Questions and Answers product. You can print it out to take with you anywhere, or simply open it on any device that supports PDF files (you may need to install a PDF reader if you don't have one). No, you can't. The PDF is an add-on to your main purchase (Questions and Answers) and cannot be purchased separately. What OS does the Testing Engine run on? Train4sure Testing Engine is currently supported by Windows (XP and all newer versions). We are currently working on Android and iOS versions of the software. I don't have a Credit Card. How can I pay for my Train4sure purchase? Please contact us, and we'll find the best solution for you. I am interested in the Testing Engine for my employee training program. Do you have any special corporate offers? Yes, we do, and we welcome corporate customers. Please visit our License Program or contact our Sales Team at sales@train4sure.com. 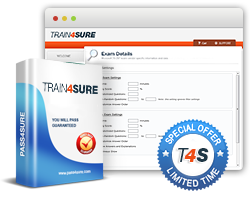 Train4sure guarantees that you will pass your CompTIA certification exams if you use our training materials. We'll issue a refund if you fail!